in freshwater aquariums. The species is native to the Amazon Basin. 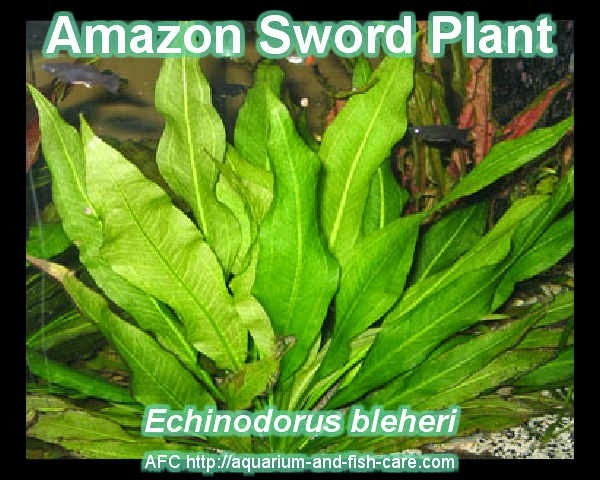 A common experience with Amazon Sword plants is that you will find them growing well, otherwise completely healthy, but with almost transparent leaves. Over time, the general health of the plant begins to degenerate. This problem is caused by the chloroplasts in the leaves beginning to die, how badly the plant is affected depends on how advanced this has become. Unfortunately, there are a number of causes of this particular problem so it may be necessary to try a number of different approaches before a remedy can be found. If the plants in your tank are overall generally healthy, then do not worry too much, it is most likely that there will be no serious long-term damage you need to be concerned about. The most likely causes are a lack of soft, slightly acidic water, lighting conditions, and either an iron or potassium deficiency. One of the most important aspects of plant keeping, outside of maintenance needed to keep water chemistry balanced, is ensuring that plants have the correct level of lighting. It is particularly helpful if lighting used is in the red or blue spectrum, as it is this wavelength that is used for photosynthesis. Amazon Swords will need roughly 2 to 3 watts per gallon of light to grow properly, if you have a tank greater than 18 inches in depth you will need a little more to penetrate to the bottom. If your tap water is hard and alkaline, consider using distilled water for water changes. A decent fertilizer with Iron and Potassium as some of the macronutrients it provides should eliminate any deficiencies. It is advisable to make sure that everything in your aquarium has very similar needs and the closer this is, the better! It is always important to strike this balance, particularly if things begin to go wrong with one or more aspects of the aquarium. This is the point where you may change lighting intensity, the balance of water chemistry and other factors of the aquarium. Providing that you have done your research beforehand, trying to treat problems with your Amazon Swords should go smoothly, just make sure to be vigilant on how the aquarium fares with changes in water chemistry, lighting, hardness, and acidity. Keeping Amazon Swords can be very rewarding. If you begin to have this problem with them, once you have worked out what you believe has gone wrong or may be causing the issue, you are well on the way to treating them successfully.